I was watching that M3 for month's, I cant believe it sold for so much. Was the frame damaged? Was the engine anything special? Nothing special about it at all. 125k mile car, I was second owner. Engine was rebuilt by my local BMW dealer in 2012 at 108k. Unibody was severely damaged from the impact. Someone is going to get the car and be severely disappointed. So... over/under that the winner on that MT2 auction bails and it's relisted? Just saying, new user who had signed up this month, and then goes way high on the value. Seen it happen a lot, and yet BAT still won't change their policy. I'm not saying I don't appreciate the value bump since it only benefits my collection, but I also hate seeing the sellers getting screwed by flaky bidders and BAT's attitude. My guess would be the color (car and wheels) or quality of respray, missing bumper caps might make people wonder about how thorough of a restoration it underwent and non BMW aficionado's may not like or "get" the M tech interior. The pictures weren't great either. Hard to say these days. There are people with money looking to buy in. The car should be in as new condition so $30k while strong for any non M3 isn't completely out of the ballpark. Considering EAG sells clean 20-50k mile 318iS and 325iS's for low - mid 20's...this one looks to be right in line. Obviously, that's not where my money would go but to each his own. Any of you PNW guys recognize this M3 that just went up ? I always thought e30 m3 had the dogleg gearbox, but i've seen a few on BAT now that have the standard pattern on the shifter. 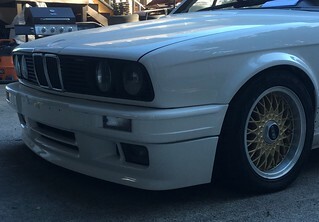 So am i wrong to assume all e30 m3 have dogleg gearboxes? US M3's have standard gearboxes. ..and in the end, it's a Baur, which is still a very divisive model in the E30 world - you either really love them, or want no part of them. I don't expect it break 10K in a normal environment. But then again.. BAT is often full of hype bidding. This thing looks like a riot. Going to be interesting to see how it does on BAT...race prepped cars haven't been known to do well on there. I also like how bidding went from $3k straight to $19k...someone is a little trigger happy!